Nuriootpa (/ˌnjʊəriˈʊtpə/ NEWR-ee-UUT-pə) is the major commercial centre in the Barossa Valley in South Australia, about an hour's drive north of the capital, Adelaide, and 77 kilometres by rail. The name of the town is reputed to be the local Aboriginal word for "meeting place". The first recorded Europeans to visit the locality, on 3 March 1838, were the exploration party of John Hill, John Oakden, William Wood, and Charles Willis, en route to the Murray River from Adelaide. Since the 1930s, Nuriootpa has been cited as an example of inspired community development. The town's community owned and operated retail businesses have funded public facilities, including the Senior Citizens' Club, the swimming pool, the kindergarten and recreation areas. The short-lived progressive Adelaide movement Common Cause arranged a visit by future Prime Minister Ben Chifley to Nuriootpa in 1944 which led him, inspired by its approach, to promote the town as a model for community co-operation. The Adelaide architect Louis Laybourne-Smith prepared a plan for the town's recreation and education area, known as its 'War Memorial Community Centre' at that time. Much of this plan has been realised, including Laybourne-Smith's unusual 'fan-shaped' Olympic-sized pool. The 1950 Australian Grand Prix, which was Australia’s premier motor race of that year, was held on 2 January 1950 using the Nuriootpa Road Circuit, a temporary course utilising roads in and around the town of Nuriootpa. The race was won by Doug Whiteford driving a Ford V8 Special. The first race meeting to use the circuit had been held in April 1949. The first stage of the 2014 Tour Down Under was held on 21 January 2014, starting from the town and finishing in Angaston. The 135 km stage was won by Simon Gerrans of Orica-GreenEDGE. 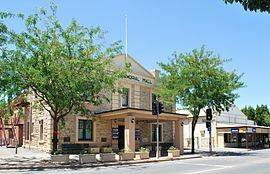 Nuriootpa is in the Barossa Council, although the northern outskirts are in the Light Regional Council. It is in the state electoral district of Schubert (and Light for the outskirts) and the federal Division of Barker (and Division of Wakefield for the outskirts in the Light Regional Council). Nuriootpa was home to the short-lived Nuriootpa and District Community Diary (November 1955 - November 1956), a monthly magazine subtitled ": monthly news bulletin of the Nuriootpa War Memorial Community Centre Inc". ^ Australian Bureau of Statistics (27 June 2017). "Nuriootpa (State Suburb)". 2016 Census QuickStats. Retrieved 4 May 2018. ^ http://trove.nla.gov.au/newspaper/article/31749868?searchTerm=oakden%20hill%20willis&searchLimits=l-advstate=South+Australia%7CRegister newspaper, 17 March 1838, pp. 3-4. ^ Howard, Graham. "1950". In Howard, Graham. The Official 50-race history of the Australian Grand Prix. Gordon, NSW: R & T Publishing. pp. 148–157. ISBN 0-9588464-0-5. ^ "2014 Santos Tour Down Under results, stage 1". VeloNews. Competitor Group, Inc. 21 January 2014. Retrieved 21 January 2014. ^ "Climate statistics for Nuriootpa, SA". Bureau of Meteorology, Australia. Retrieved July 17, 2016.